Read these first. These rules apply to all Toasted Cheese writing contests. Note: These guidelines are for contest entries only. FAQ answers: No entry fee. No geographic restrictions. Use the email address that you’d want a winning gift certificate sent to or include that email address in a cover paragraph. One entry per author or set of authors. Only one gift certificate will be sent per entry (i.e. gift certificates will not be split between authors who share a credit for a single winning entry). Disqualifiers: No attachments of any kind. No simultaneous submissions. Do not send before contest opens. Do not send after contest closes. Tips: If a genre contest, write in that genre. Follow the theme(s). Stay within the word count parameters. Note the correct email address. Include a brief bio at the end of your entry. Stories must be original and previously unpublished. See #6 below for formatting guidelines. Are you a human who lives on Earth and is not a TC editor? Then you may enter the contest (IOW: there are no geographic or other restrictions). Keep your money. There are no entry fees for any Toasted Cheese contest. Proofread. Grammar, punctuation, or spelling errors will count against your entry and irritate the judges. Grab the right email address. Contest entries must be emailed to the address designated for the contest you’re entering (see individual contest rules below). Replace [at] with @. 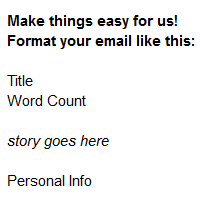 Follow this format: place your contact information [name, email, address (optional), phone number (optional),] at the opening of your email, then the story (including title and word count), then a brief biography (100 words maximum) after your story. All identifying information will be removed before judging. Adjust your font and font size when you paste your entry into the body of the email, thinking of the fact that some judges might be reading on small devices. Even though the judges aren’t seeing your original email, the editor who removes your contact info and bio doesn’t change your formatting, font, or font size so pasting a story that you wrote in 8-pt Comic Sans may doom your entry. We recommend using 10-12-pt in a traditional font like TNR, Arial, Verdana, Helvetica, Georgia, etc. Don’t enter more than once; we have a limit of one entry per person per contest. If you send a corrected version of the same entry, only the final entry received before the deadline will be considered (see #4 for the best way to prevent doing this). Don’t get disqualified. Late entries, entries that do not conform to contest guidelines, entries with attachments, and entries sent to any address other than the designated contest address will be disqualified. Toasted Cheese and its staff are not responsible for any electronic transmission problems. Wait. We’ll let you know when to expect a notification of winning entries for each contest (roughly 6 weeks after the deadline). Entrants receive this notification before public announcements are made so you have time to prepare yourself for accolades. First, second,* and third* place stories are published in Toasted Cheese Literary Journal. Honorable mentions may also be awarded. Know your rights. By entering a contest, you grant TC exclusive electronic rights for a period of 90 days, should your work be chosen as a winner, as well as a non-exclusive right to maintain a copy of published work in the literary journal archives indefinitely. Effective January 2008, you also grant Toasted Cheese the right to post an audio version (podcast) of your work on the site (authors of work published 2001–2007 will be contacted to obtain permission for this use). You retain all other rights, including the right to re-publish the work in non-electronic form at any time. Any subsequent publication should include the credit “originally published in Toasted Cheese.””Exclusive electronic rights” means that you agree not to re-publish your work elsewhere online while the issue featuring your work is current. “Publish” means any public display of your work, and includes your personal website and posting to message boards. You are welcome to link to the page featuring your work instead. Once the issue has been archived, you are free to re-publish your work online. Note: due to the volume of entries we receive, most judges don’t provide feedback on individual entries. After the contest is closed, we invite all entrants to post their stories on our critique forums. We also close the email address so replies to the notification won’t be read. If you need to contact us, the notification will tell you how to do that or you can go here. Note: Amazon gift cards sent to winners who use AOL and Yahoo email addresses more often than not do not make it into the winner’s inbox. AOL also has a history of bouncing replies/notifications and making submissions look unusual or unreadable on our end. Our recommendation is to use an email address from another provider when submitting any work to Toasted Cheese (or any other literary journal). Continue to Three Cheers and A Tiger rules. Continue to A Midsummer Tale rules. Continue to Dead of Winter rules. *Toasted Cheese reserves the right to not award second and third place if, for example, the quality of the entries does not meet the journal’s standards.